How to generate retirement income for parents? This is a guest post written by Manikaran Singal who is a certified financial planner and runs a personal finance blog -Â Good Moneying. This is a very common question these days among so called â€œSandwich Generationâ€ whoâ€™s juggling between the different priorities like â€œto manage between their childâ€™s future and own retirementâ€ and also taking care of the needs of their parents. Being responsible children everyone wants to support the parents. They have sacrificed their desires, hobbies etc. to give us a secure future, so now is our time to pay back. Even though the topic is all about income generation, since I am a financial planner, I could not stop myself to add on some financial planning touch into it. There can be 2 situations where the approach can vary while working on this aspect. 1)Â Â Â Â When your parents are financially dependent. 2)Â Â Â Â Where the parents are financially independent. Understanding: Making arrangements may not be enough unless that arrangement actually serves the purpose. You have to understand your parentsâ€™ requirements. You need to talk to them. Proper communication is very much required for proper planning. I know that subject of money has always been a taboo in our Indian society but this is where the challenge lies. Discuss with them their wishes, hobbies, pending desires, their monthly expenditure etc. If you are staying with them then it may be easy for you to understand the situation but if not then better to improve the communication. Donâ€™t give solutions to them just listen. Listening is the key to proper understanding. Also this step applies to both the situations mentioned above. As it is you who have to arrange income for them, so you need to have thorough understanding of your financials. This will help you in figuring out the grey areas where you can make some adjustment for betterment of your parents. You have to dig deep into your cash flows. A)Â Â Â Â Note down each and every expense, your discretionary / Non-discretionary spending. B)Â Â Â Â Family expenses, expenses on self, on child etc. C)Â Â Â Â What expense you are making on your desires and what on your needs. D)Â Â Â Insurance premiums of not required policies you are paying just because you donâ€™t want to book the loss or your. So called friend or your banker would feel offended if you discontinue that. a)Â Â Â Â When parents are financially dependent. This situation can be managed partially when you are living along with parents, as most of their basic expenses will get managed within the family expenses. But you have to take care of your parentâ€™s desires and independence also. Along with you have to take care that they should not feel like a burden on you. So adjust your cash flow accordingly and start giving some monthly amount to them. Better to include this â€œmonthly payments to parentsâ€ in your non-discretionary expenses option, so your surplus gets accordingly adjusted for your other goals. If the house is in your parentâ€™s name then you may start giving them the monthly rent, this way you may get some tax benefit also. If you have some already accumulated corpus, then you may invest that in post office monthly income scheme, senior citizen saving scheme or bank fixed deposits to generate comfortable, safe and secure monthly income. Â You may also buy the immediate annuity plan. Also if at all required you can use products like â€œReverse Mortgageâ€ to generate comfortable income for them. Donâ€™t forget to get them adequately insured of health, as this will indirectly help you in saving your savings. b)Â Â Â Â When the Parents are not dependent. If Parents are independent, getting a decent pension along with interest income, are adequately insured under government sponsored schemes and has no liability as such, then also it does not absolve you from your responsibility. Many times it has been seen that pension may not be enough or may only be enough for the basic expenses. So in this scenario you have to support your parents. Where parents are independent, many times it has been seen that they are in a habit of distributing the surplus they have in the form of gifts, like giving down payment for car or house, or buying insurance policies in the name of grandchildren etc. Though one should not allow them to do this but all this should be handled tactfully as it should not even hurt there ego. In other words donâ€™t allow them to part with their savings. You may gift them some things of necessity time by time and share with them there responsibility of gifting things to relatives on various occasions like marriage, child Birth, festival etc. Please note that you should not intrude in their privacy and dignity. Start a parentâ€™s welfare fund kitty and keep on putting some amount every month for parentâ€™s welfare and responsibility. Adjust your cash flows accordingly. This fund will help you to manage emergencies in a better manner. You may also gift them a vacation every year. Please understand that in any financial arrangement, Intention matters more than resources. There are some more aspects to support parents besides generating regular income for them like making bank accounts joint, reviewing of Nominees, being in touch with doctors, getting regular health check-up, arranging a caretaker, a driver , streamlining the financials etc. which is very much required when we are involved in financial planning for parents. But to start with â€œwork on to improving the communicationâ€ which is the most important among all. This post is from the Suggest a Topic page. Author Guest BloggerPosted on July 10, 2012 July 10, 2012 Categories Personal Finance3 Comments on How to generate retirement income for parents? Once quite popular with the investing community, post office small saving schemes have recently gone out of favour with the investors. No hike in the interest rates of these schemes for quite a long period of time, higher interest rates on other instruments like bank fixed deposits, NCDs, tax free bonds etc. and aggressive marketing by the banks and other issuers have played their role in people not investing in post office schemes in large numbers as they used to do earlier. In fact, with bank deposits giving over 9% return, NCDs of companies like Muthoot, Religare Finvest, Manappuram etc. yielding 13% plus returns and the tax free bonds giving a similar â€œtax-freeâ€ return, investors are switching their funds into these deposits and hence there has been a net outflow from the post office schemes. To make these schemes catch up with other market instruments and following the recommendations of Shyamala Gopinath Committee, the government decided in November 2011 to link their interest rates with the market rate of interest. It has also been announced that the rate of interest on small savings schemes will be aligned with the rates of government securities of similar maturities on April 1 every year. Earlier there were media reports that the interest rates on all small savings schemes have been made â€˜floatingâ€™ but later on Finance Ministry clarified that the interest rates will remain fixed till the maturity of the schemes except for PPF, for which the applicable rate will remain floating and will change on April 1 every year. The one thing I’m certain of is that it has made Public Provident Fund (PPF) a darling of a scheme for the investors, especially people in the 30% tax bracket who are looking for long-term investment avenues. 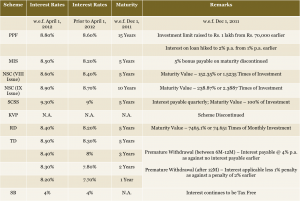 Rate of interest on PPF has been hiked twice from 8% to 8.6% w.e.f. December 1, 2011 & then to 8.8% w.e.f. April 1, 2012. The effective rate of interest for a person in the 30% tax bracket works out to approximately 12.73%, which I think is amazing, considering it also gives you a tax deduction under section 80C. The ceiling on annual contributions to PPF has also been hiked to Rs. 1,00,000 w.e.f. December 1, 2011 from Rs. 70,000 earlier. I think this is the first time in the history of Indian fixed income investments that the interest rate on PPF has been fixed at a higher rate of interest of 8.80% against the interest rate on Employeesâ€™ Provident Fund (EPF) of 8.60% and at the same rate of 8.80% on General Provident Fund (GPF). Though the interest chargeable on loan taken against your PPF deposits has been hiked to 2% p.a. as against 1% p.a. earlier, the idea is to discourage investors to take money out of a scheme which is meant to be used for one’s retirement years. A loan facility of up to 25% can still be availed from the 3rd financial year till the 5th financial year while a withdrawal of up to 50% is allowed from 6th financial year onwards. Monthly Income Scheme (MIS) and Kisan Vikas Patra (KVP) have been the most popular schemes of post office with approximately 35% and 25% share respectively of the total outstanding of all small saving schemes put together. Issuance of Kisan Vikas Patra (KVP) has been discontinued w.e.f. November 30, 2011 due to apprehensions of it getting used for money laundering (parking unaccounted money). It is important to mention here that KVP was a kind of bearer instrument as it did not carry the investor’s name on it, was freely transferable and no KYC requirements were there for one to invest. The changes have also taken the steam out of Monthly Income Scheme (MIS) by scrapping the payment of 5% bonus on maturity, which has been the most attractive feature of this scheme. Post offices now have one more dish on their menu to offer – National Savings Certificates (NSCs) with 10 years of maturity. 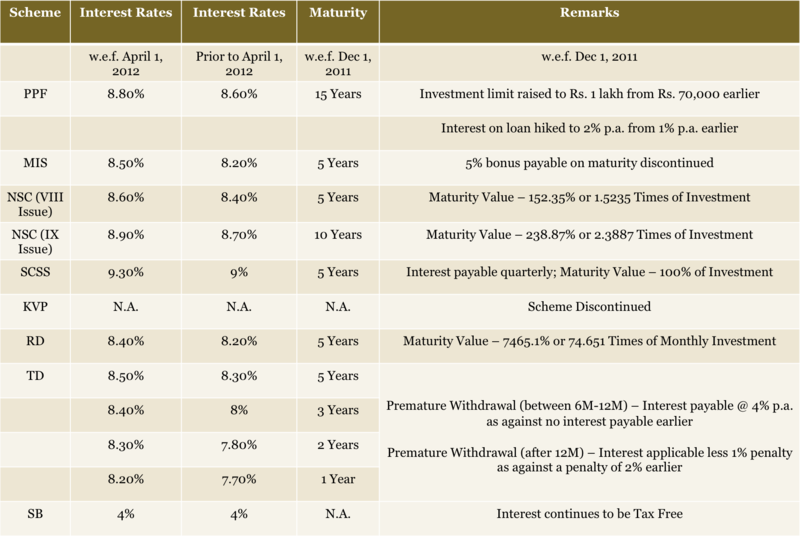 These new NSCs carry 8.90% rate of interest p.a. and like the older NSCs, the amount invested as well as the interest earned every year qualify for a deduction under section 80C. Interest rates offered on Senior Citizens’ Savings Scheme (SCSS), time deposits (TDs), recurring deposits (RDs) and saving bank accounts have also been hiked in line with the market rate of interest. Though interest earned on all these schemes is taxable, these schemes have been left untouched as far as TDS is concerned except SCSS on which TDS is deducted if the interest amount is more than Rs 10,000 per annum. Interest rate on SCSS has been raised to fetch 9.30% and it is payable quarterly. MIS and SCSS are the best investments for senior investors who desire regular stream of definite cash flows either monthly or quarterly. SCSS continues to enjoy deduction under section 80C though it is likely to change once DTC comes into effect. Maturity periods of MIS and the older version of NSCs have also been reduced from 6 years earlier to five years now. In case of premature closure of time deposits after one year, the deduction from the applicable interest rate has been reduced to 1% p.a. from 2% p.a. earlier. An interest rate equal to the post office savings bank rate of 4% p.a. will be payable if the premature closure is made after the first 6 months of opening the time deposit. I think passive investors looking for a reasonable risk-free return, can consider parking their funds in these post office schemes. It is just a matter of time that these Post Office schemes will again become lucrative from the interest rate point of view once the inflation comes down and banks start cutting rates on their deposits seeking direction from the RBI. The fate of many of these schemes will undergo many changes with the onset of the DTC but let us see how things pan out as the applicability of DTC continues to remain in question given the way it has been deferred year after year. 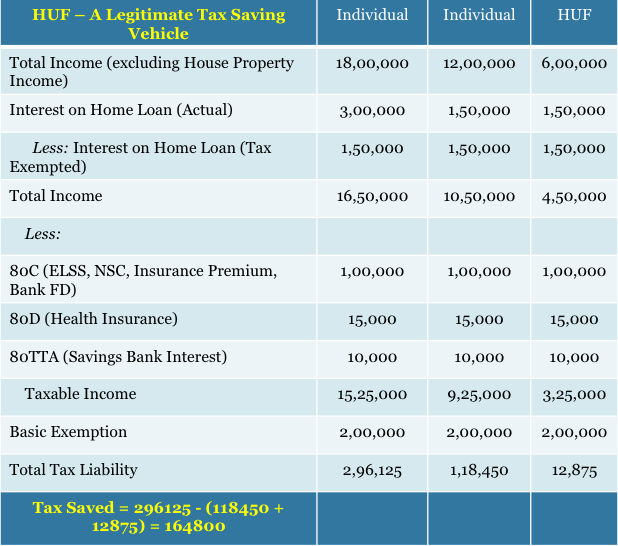 The Hindu Undivided Family (HUF) structure is a very effective way to save tax and a lot of people are eligible to create HUFs but somehow there is very little awareness about it. I think that’s because most of us don’t know how easy it is to create an HUF. In fact, it is as easy as getting married. I would say it might be difficult for somebody to get married but it is very easy to create an HUF. An HUF is automatically constituted the moment a person gets married and completes seven pheras around the holy fire and they get married. That means a Hindu male needs to do nothing to get an HUF created but to get married to a Hindu female. It is one marriage gift that all Hindus get from the government or Hindu Law. It is not necessary to have children to create HUF. Sikhs, Jains and Buddhists can also create an HUF under the Income Tax Act even though they are not governed by the Hindu law. An HUF is a separate and a distinct tax entity. The income of an HUF can be assessed in the hands of the HUF alone and not in the hands of any of its members. The senior most member of the family who manages the affairs of the family is called the Karta. Minimum two people (at least one male member) are required for the HUF to come into an existence. A coparcener is a member of the HUF, who by birth acquires an interest in the joint property of the family, whether inherited or otherwise acquired by the family. A daughter, after her marriage, would remain a coparcener in her father’s HUF and at the same time, can become a member in her husband’s HUF. In the event of the death of the Karta and in the absence of any male member, two females can continue to run the HUF and the senior female can take over as the Karta. A son can create his own HUF while remaining a coparcener in his father’s HUF. Capital Infusion: Here comes the most difficult part for someone to start the HUF operating – generating capital for the HUF. One should not contribute his own personal assets or funds into the HUF as any income generated from these assets or from its investment will be clubbed into Individual’s personal income under Section 64 (2) of the Income Tax Act and hence taxed accordingly. But there is a way out – one can transfer his personal assets or funds into the HUF if the income generated from these assets or from its investment results in a tax free income (like tax free bonds) and hence there is no scope of any tax liability due to clubbing of taxable income. This tax free income can then be reinvested to earn even taxable income and eventually all of the income would fall out of the clubbing provisions. Gifts or inheritances meant for the benefit of all the members of a family should be diverted specifically to the HUF. HUFs are liable to pay tax if the value of the gifts taken from the strangers exceeds Rs. 50,000. Though there is a limit for an HUF to take gifts from the strangers, gifts of a higher value can be taken from the relatives, who are not the members of the HUF. A father can also gift money to his son’s HUF but need to specify in the gift deed that the gift has been made to the son’s HUF and not to the son as an individual. Ancestral property can be an asset of the HUF and an income earned on this property can be classified as the income of the HUF. If any of these ancestral properties are sold, the money received on such a sale should be transferred to the HUF. How to get started with the HUF? Once there are two eligible family members ready to operate an HUF, the first thing to do is to apply for a PAN card in the name of the HUF and have a separate bank account opened. For a PAN application, an affidavit by the Karta stating the name, father’s name and address of all the coparceners on the date of the application is considered sufficient as the document proof of identity of the HUF. Also, the identity and address proof of the karta will be treated as the address proof of the HUF. Then start seeking for gifts or inheritances from relatives or strangers, keep on infusing your own capital, transfer family’s assets/properties to the HUF and do all the possible things that you can keeping in mind the clubbing of income provisions. Here is a link that contains a sample HUF deed. As already mentioned, an HUF is a separate and a distinct tax entity and just like any other Resident Individual assessee, it also enjoys a basic tax exemption of Rs. 2,00,000. All other tax slabs are also exactly same as for an Individual. Here is a useful link from Bemoneyaware that shows the TDS rates for Individuals and HUFs. Section 80C: HUFs can claim tax exemption under Section 80C by investing money in ELSS, ULIPs, traditional insurance plans, NSC or 5 year Bank FD with a scheduled bank. Principal repayment on a housing loan taken by the HUF can also be claimed under this section. HUFs are not allowed to invest in PPF anymore. Section 80D: Members of the HUF can take a family floater policy and make the HUF pay for its premium and enjoy the tax benefit too. Section 80DD: If any dependant member of the HUF is normally disabled (not less than 40% disabled) and the HUF makes an expenditure for the medical treatment, training and rehabilitation of that disabled member, then the HUF can claim a deduction of Rs. 50K under this section. If the condition is of a severe disability (equal to or more than 80%) then the HUF can claim a deduction of Rs. 100,000. Section 80TTA: Interest earned on the money deposited in the savings bank account up to Rs. 10,000 p.a. is exempt for an HUF also. Section 24 (b): Interest on Housing Loan: If an HUF takes a loan for buying out a residential property, it can claim a deduction of Rs. 150,000 in respect of Interest on Housing Loan. 30% Standard Deduction on a Rented Property: An HUF can claim a standard deduction of 30% from the rental income it earns by letting out a property. Capital Gains on a House Property: Tax on Capital Gains made by selling a house property can be saved if the HUF invests the proceeds into buying another property within two years from the sale of the said property. The money can also be invested in Capital Gain bonds offered by REC and NHAI with a lock-in period of 3 years. The interest income on these bonds would be considered a taxable income of the HUF. Karta can be paid a reasonable salary for his services of managing day to day affairs of the HUF. The salary will be considered his personal income but at the same time it is deductible as an expense from the books of the HUF. Only one member or coparcener cannot form an HUF. There have to be at least two members and at least one male member. HUF can keep its normal functioning even with two females after the death of its sole male member. The Hindu Succession (Amendment) Act 2005 has given equal rights to male and female in the matters of inheritance as a result of which a daughter now also acquires the status of a coparcener. An HUF cannot become partner in a firm but a Karta can. These were some important aspects when it comes to creating an HUF and everyone, who is eligible to create an HUF and pays taxes, should strongly consider this option as it is a very efficient and good way to save tax. This is a guest post by CA Karan Batra, Accounting and Tax Consultant based in New Delhi. We all know that investing in equities through mutual funds is a great option for an individual as mutual funds not only employ professional management but also have experience of investing in equities and are a safer and better bet as compared to directly investing in equities which have an inherent risk element attached with them. A mutual fund employs highly qualified management, keeps a regular tab on the stock markets, buys and sells equities on our behalf and does everything to ensure that our money is put to best use while ensuring its safety. But what do mutual funds get in return for these services, in other words â€“ how do mutual funds earn? Many people have this feeling that it doesnâ€™t matter how mutual funds earn till the time our money is growing in mutual funds. But the fact of the matter is that these mutual funds earn through your money only and mutual fund charges are an important factor while deciding whether to invest or not to invest in a specific mutual fund. 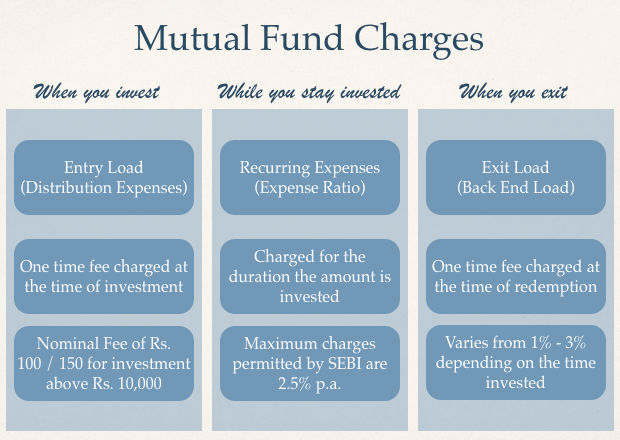 Letâ€™s first have a look at the types of fees charged by mutual funds and then Iâ€™ll summarize the impact of these charges. As the name suggests, this fees is charged by mutual funds at the time of investing in the mutual funds. However, this fee does not go into the pockets of the Asset Management Company and is rather paid as distribution fee to the mutual fund agent through which the investor has applied for subscription. Prior to August 2009, different funds used to pay different amounts as commission to the agent which could sometimes be as high as 2.5% as well. However, in Aug. 2009 SEBI abolished any entry load to be collected by AMCâ€™s to be paid to agents but this didnâ€™t go well within the industry as agents who usually do a lot of marketing and selling on behalf of the company werenâ€™t compensated for their services as a result of which they were not actively working and promoting mutual funds. In case of Systematic Investment Plan (SIP), where the total commitment towards the SIP is more than Rs. 10,000, a transaction charge of Rs. 100 will be levied payable in 4 equal installments starting from the 2nd to the 5th installment. This entry load is payable only in case the investment is made through an agent. In case of direct application being received by the AMC, no entry load is to be collected. Although these charges are collected by the AMC but are payable to the mutual fund agent and you are not liable to pay any other charges to the Mutual Fund Agents. Recurring Charges are the charges which are collected by the AMC for professional portfolio management services provided to the investors. An AMC employs highly experienced and qualified staff whose prime concern is to take care of your investments and for providing such services the AMC collects fees which is also referred to as Expense Ratio. Over and above these above stated expenses which are incurred on an annual Basis, AMCâ€™s also incur expense at the time of New Fund Offer. To encourage individuals to invest in a mutual fund, an AMC incurs many onetime marketing expenses at the time of launch of the mutual fund. SEBI has prescribed a maximum ceiling on such expense being 6% of the total net assets and these expenses are amortized over a period of 5 years. Assuming that an equity scheme generating 15% returns has net assets of Rs 100 crore, with the operating expense ratio at 2.50%, the effective return would be 12.5% (i.e. 15-2.5). Operating expenses are calculated on an annualized basis and are normally accrued on a daily basis and the NAV so computed is shown after deducting these Recurring Expenses. These are the charges which are liable to be paid in case an investor exits a fund before a specified time frame. Mutual Funds have a long term horizon and invest with a long term view. However, if a large number of redemption is applied for within a short period of making the investment, it spoils the total corpus available with the mutual funds as a result of which they may have to make necessary changes to the whole portfolio. To discourage investors from withdrawing funds within a short period, almost all mutual funds charge exit load of 1-3% based on the time within which an application for redemption is filed. They are usually in brackets of 6 months, 1 year etc. and the lower the time frame â€“ the higher would be the exit load. There is no standard exit load fees charged by these AMCâ€™s and it varies from scheme to scheme and is disclosed in the prospectus of every scheme. Exit Load is also referred to as Back-End Load and the maximum fees that can be charged by Mutual Funds for premature withdrawal is 7%. However, most Mutual Funds charge exit load in the range of 1-3% depending on the time duration for which the funds were invested. From this discussion it is clear that mutual funds charge recurring fees based on its asset base with the charges getting decreased as the fund corpus increases. Thus as the asset size increases, the expenses charge also decrease which would directly impact the NAV of a mutual fund scheme. Please note that these are the maximum expense ratios permitted by SEBI and the actual may be a bit lower. Although these charges keep changing from year to year, note that a difference of 1% expense ratio between 2 funds may turn out to be a difference of 10-15% over a period of 10 years. Moreover, it is also highly advisable to keep an eye on the exit load charged by these AMCâ€™s while comparing two funds as different funds charge different exit loads. Guest Post: Do you know these 8 Investment Myths? The author is the Founder and Director of Holistic Investment Planners (www.holisticinvestment.in) a firm that offers Financial Planning and Wealth Management. He can be reached at ramalingam@holisticinvestment.in. Today I am going to debunk a few investment myths. You will know â€˜why individual investors are failing miserably and how you can avoid being one of themâ€™. Have you started planning for your retirement? You may be saying â€˜who me? I am too young to be thinking about retirementâ€. It is not so! Rethink. You should have started thinking about it yesterday. Because time flies quickly. If you were smart, and planned for retirement when you are young, your retirement years will be really those â€œGolden yearsâ€. If not you need to compromise and you need to work longer and retire later than others. In the words of Warren Buffet â€œSuccess in investing doesnâ€™t correlate with IQ once youâ€™re above the level of 125. Once you have ordinary intelligence, what you need is the temperament to control the urges that get other people into trouble in investing.â€ You donâ€™t need a super brain for making investment decisions. You only need common sense and discipline. If you donâ€™t have enough time and expertise, then you can get assistance from professional financial planners. If you are investing in what is hot, then you are following the crowd. If you follow the crowd, you will get what others are getting. You will not get anything more. You need to be fearful when others are greedy and you need to be greedy when others are fearful. So donâ€™t go by the market trend or the hot pick of the month. Think like a contrarian and follow value investing. You need to be calm, patient, disciplined, and rational. You donâ€™t have to be smarter than the rest; you have to be more disciplined than the rest. In other words, they want to time their exit when the market has reached its top and to time their entry when the market has reached a bottom. This not a practical idea because there are so many influencing factors to the stock market. Predicting all the factors and making investments is practically not possible.Â Instead of that stagger your investments through SIP, STP and stay invested for long term. Which group you are in? There is a group of people who invest just to save taxes. They will not bother to invest anything more than that. They will meet their objective of saving tax. There is another group which invests to save tax as well as to save for their other life goals like retirement, childrenâ€™s future. They will meet the objective of saving tax and achieving other life goals. Kindly check you belong to which group. Author Guest BloggerPosted on February 12, 2011 February 11, 2011 Categories InvestmentsLeave a comment on Guest Post: Do you know these 8 Investment Myths? Today I present a guest post from Manish Jain of MProfit, which is a desktop portfolio management software. His message of thinking about asset allocation is a timely one as the market gets flooded with bond issues, and IPOs, and it gets easy to get immersed in yield calculations and forget about the big picture. So, without any more commentary from me, here are Manish’s thoughts. When it comes to finances many people just don’t know where to begin. Â You watch CNBC-TV18 for stock tips, you listen to relatives for investment strategies or you read financial blogs for general advice. Â That is the equivalent of getting advice about how to fix your car without a mechanic inspecting your car. I would suggest you stop everything and first take an inventory of all your financial related instruments – assets and liabilities. Find and categorize all your assets – Â property, equities, fixed deposits, LIC policies, etc.Then take a look at your liabilities. Next, create an asset allocation table so you can understand where most of your assets are held. This will give you an idea if all your money is in a single asset class or evenly distributed. Asset allocation is a way to spread the risk, imagine you have all your money in a single company and it goes bankrupt or 80% of you money is in property and there is a dispute that may take many years to resolve. Once you understand your asset allocation you can now decide how to increase your wealth by changing these percentages. Think of your asset allocation mix as a road-map. The first asset class people explore are equities, I always tell people there are 3 stages to equity investing and you have to be comfortable at each stage before going to the next. Â Stage 1 – purchase a Sensex/Nifty Index/ETF Fund that is tracking the whole market. Â Stage 2 – purchase specific mutual funds based on the research you have done. Â Now if you feel you can do better than an index fund or a fund manager then Stage 3 is to purchase direct equities in the companies you have researched. Equities is one way to diversify and there are risks involved. The most important thing is to be comfortable with the ups and downs of those decisions.Â Now that you have a guide via your asset allocation table you can now go back to watching CNBC-TV18, listening to relatives and/or reading blogs and deciding whether thatÂ informationÂ is relevent to your financial situation. 401(k)s are employer provided retirement savings plans. The employee decides how much to contribute a month. The employee gets to choose what to invest in from a list of mutual funds. Contributions are put into the account before they are taxed.Â Building interest is not taxed.Â All withdrawals are taxed.Â If the person lowers their tax bracket at retirement, the savings here can be great. Company matching provides financial benefits to employees.Â The maximum amount a company can pay is six percent the employeeâ€™s annual salary. The maximum amount a person can contribute to their 401(k) is $16,500.Â If an employee is over 50 Â½, they can contribute an additional $5,500 annually. Annuities are insurance contracts people buy from insurance companies.Â By agreeing to pay a set amount of money up front, the owner receives money back after a set time. Annuities are not normally good retirement investments unless a person has maxed out other options and wants to save more money tax deferred. Annuities have many more up front fees than 401(k)s.Â To take your money out before a minimum period (usually from three to five years), you must forfeit a surrender fee.Â This fee is typically between 5% and 7%.Â In addition, you must pay the 10% early withdrawal penalty to the IRS. Payments are taxed first.Â Contributions are not made pre-tax.Â Earnings are tax deferred but are taxed as ordinary income when distributed.Â This is a higher rate than the capital gains rate used for 401(k)s.
IRAs are self-directed retirement savings accounts.Â There are eleven types.Â Some are done through work.Â The two most common ones are the traditional IRA and the Roth IRA. With the traditional IRA, the amount contributed is tax exempt but everything is taxed when distributed. With the Roth IRA, money is contributed after a person has paid his or her taxes on it.Â Then, when the money is distributed, it is tax-free.Â This makes sense if you think you will be in a higher tax bracket when you retire than the bracket youâ€™re in now.Â Oh, we can all hope, canâ€™t we? As long as you are younger than 70 Â½ and you are earning money, you can start an IRA. You can contribute $5,000 a year to your IRA.Â If you are over 50 years old, you can contribute another $1,000 a year.Â You can have both types of IRAs open (traditional and Roth).Â Your total contribution in one year is still $5,000 or $6,000 (for those over 50). If you are deciding to retire early, you might worry about what the IRS thinks.Â After all, they donâ€™t think you should retire before you turn 59 Â½.Â If you do, you would have to pay an early distribution penalty.Â This is a 10% fee paid to the IRS on withdrawn money.Â The penalty is supposed to help people keep their retirement money in their retirement savings accounts until they need them. Here is the lowdown on that early distribution fee. Not all early withdrawals face an early distribution penalty.Â A person can convince the IRS they need to make a hardship withdrawal.Â In this case, he or she will not pay the 10% early withdrawal fee.Â The IRS usually accepts the following reasons for approved early withdrawal of retirement savings:Â medical and funeral expenses, college tuition, to purchase, repair, or keep from losing his or her main home. Tax law under 72(t)(2)(A)(IV) lets people start early withdrawal of their retirement savings without being penalized with that 10% fee.Â This is the golden key for anybody contemplating early retirement. As long you take out equal periodic withdrawals made during the rest of your life, you do not pay the early withdrawal fee. Figuring out the right amount to take out is complicated.Â The IRS accepts three ways to figure out how much you should start taking out.Â These methods are the life expectancy method, the amortization method, and the annuity method. A lot of paperwork is involved as well.Â You have to use the same method to withdraw the money for five years or until you reach 59 Â½, (whichever one happens last). Annuities offer guaranteed income in the future (although surprisingly, the definition of guaranteed is malleable here). Annuities are tax deferred retirement investments.Â You pay taxes first for money you put into an annuity.Â The capital gains grow tax-free until you start withdrawing them.Â When you receive your annuity benefits, you will pay taxes on capital gains as well. Annuities lock up money for a minimum period (usually five years).Â If you want your money, you will need to pay surrender fees.Â Surrender fees are stiff.Â They range anywhere from 5% to 7%.Â This is in addition to the federal 10% early withdrawal tax.Â This tax occurs when money is taken of retirement funds before the owner is 59 Â½ years old. Annuities often offer lower returns than other retirement options. Contributions are not pre-tax as they are for 401ks.Â The earnings are, however, tax deferred. The IRS taxes capital gains earned in an annuity as ordinary income.Â Ordinary income taxation rates are higher capital gains rates. Annuities usually have many more fees than other retirement options. Annuities are not the best for estate planning.Â If you die before using your annuity, beneficiaries must pay taxes on the capital gains.Â Not so with mutual funds. You have maxed out 401k and IRA annual contributions.Â You still want to invest money into tax deferred investment options. Annuities do not have a contribution limit. You want to diversity your retirement plan.Â Insurance sounds wonderful to pessimists. Fixed annuity meaning the interest rate for the invested money is fixed.Â It does not change.Â The money is usually invested in low-risk fixed income products like bonds. Variable annuity meaning the interest rate for the invested money is variable.Â This type of annuity can produce a higher or lower payout.Â The payout depends on how well the investments do.Â Variable annuities usually still have guaranteed minimum returns. The equity-indexed annuity is an option that has been around for about ten years.Â This annuity acts a variable annuity with a safety net when the market gets bad. Annuities are only as good as the insurance company backing them.Â Shop around before picking one.Â Do not buy in a rash moment.Â Make sure you know whom you are dealing with. Federal law allows for tax-free exchanges between annuities.Â This can happen if you decide you invested your money in a poor annuity.Â You would like to move your money to a different annuity.Â Normally, if you take money out of an annuity before retirement, you face the 10% early distribution penalty tax.Â However, if you move the money into another annuity, US tax code 1035 allows for tax-free exchanges. Contributions made to the account are pre-tax.Â Depending on a personâ€™s tax bracket, this can mean substantial savings when investing money for retirement. The employer automatically takes out the money from the employeeâ€™s paycheck.Â An employee can typically start and stop investing into a 401(k) on a monthly basis. The employer picks a financial investment company to manage the 401(k) for them.Â Money is invested in mutual funds of stocks and bonds.Â Investment choices may be limited but are self directed. 401(k)s are not guaranteed savings plans. Withdrawals are subject to taxation.Â Early withdrawal is subject to an additional fee. Company matching is usually limited to a set percentage.Â Typically, it is worded like â€œthe company will match 50% up to the first six percentâ€ of what you contribute.Â Employers cannot contribute more than six percent of your salary to a 401(k). You can only keep company matched savings if you are properly vested with the company.Â This means you have to stay with the company for a set number of years.Â If you leave before that time is up, the amount of company matching you get to keep in your 401(k) may be limited by your vesting. Vesting normally takes three to five years.Â Graded vesting means your vesting is increased each year.Â You are vested 20% after one year, 40% after two years, etc.Â Cliff vesting means you are not vested at all until after the vesting schedule.Â For example, with a three-year vestment period, you are 0% vested after one year and two years.Â After three years, you are 100% vested. 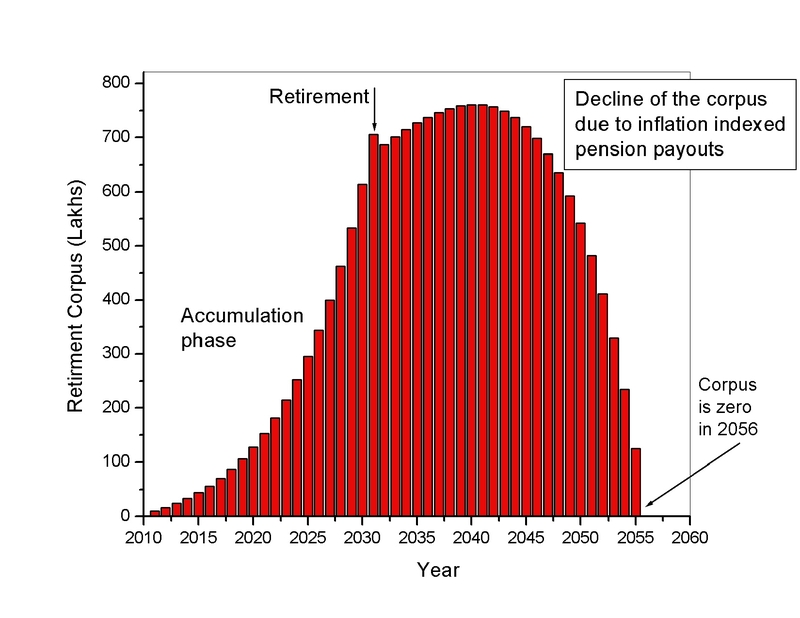 Starting in 2009, the maximum annual contribution made to a 401(k) account is $16,500. This amount increases after age 50 Â½ to $22,000. The contribution limit includes the total contribution between employee and company. Highly compensated employees face further restrictions over what they or their employer can contribute to his or her 401(k) account. Starting in 2006, employees can opt for the Roth 401(k) if the employer avails this option.Â In this case, money is contributed after being taxed but it is distributed tax-free. The Solo 401 (k) plan is just like the 401(k) plan but for self-employed people who do not have employees except for spouses. If you take your money out before you turn 59 Â½, you must pay the IRS a tax penalty of 10% of the total money withdrawn. You can roll over the money from a 401(k) into an IRA without tax penalty. Tax law under 72(t)(2)(A)(iv) is a little known rule that lets you start your withdrawals earlier than when you turn 59 Â½ without suffering an early withdrawal tax penalty.